As we are looking at maps, and having read Filip’s comment on the previous post, this extract from a map dated 11th September 1918, a month or so before the British would capture the village, shows German dispositions in and around Ledeghem (you will find Ledeghem on the far centre right of the Enemy Dispositions Maps, again in the previous post). 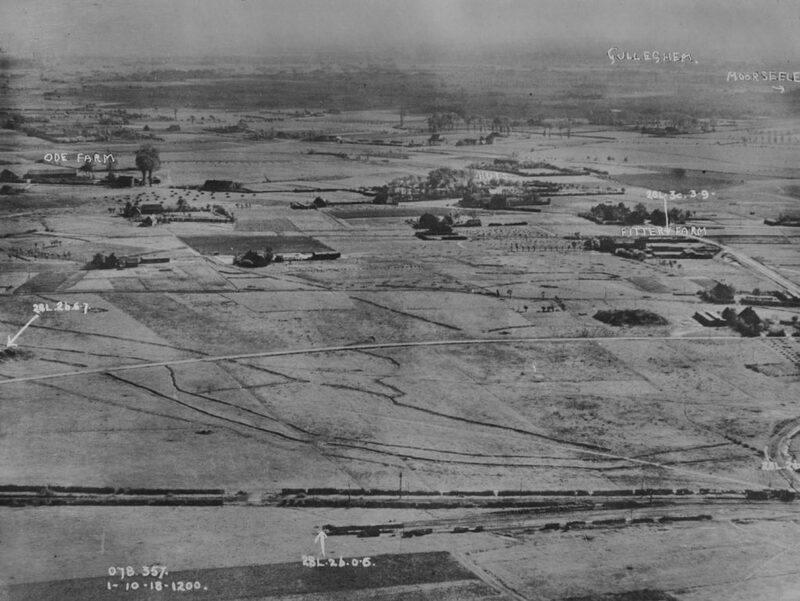 I also discovered this wonderful British aerial photograph taken at noon on 1st October 1918 showing the land to the north of Ledeghem; Ode Farm is marked on the map just south west of Rolleghemcappelle in the top right corner, and, if you follow the road south, at the next kink, Fitter Farm is also marked, and yes, it took me a while to find it too. 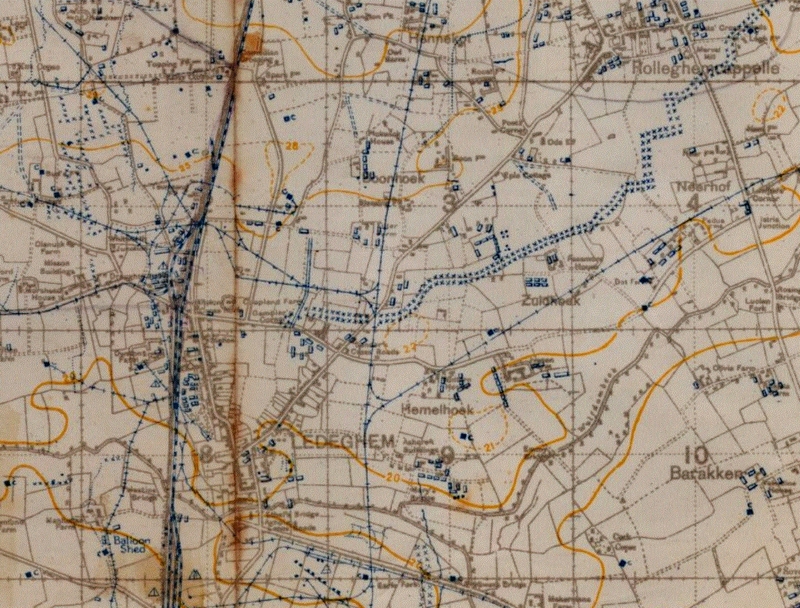 In the foreground the Menin-Roulers railway line gives us a good idea from where the photo was taken – the siding is the only one on this stretch of line, and is clearly visible an inch or so from the top of the map, the photograph therefore being taken somewhere in the very top left hand corner, looking diagonally across the map. This is one of those photos where you see something new each time you look, but for starters, you will notice that a gap has been made in the hedges lining the railway at one point (possibly with a small machine gun embrasure on either side of the opening), and if you continue onwards, gaps have also been made through the line of barbed wire and the two trenches in the field beyond, all aimed at funnelling attacking troops into the teeth of strategically positioned machine guns. And, crossing the field behind Ode Farm, the belts of barbed wire marked on the map between Ledeghem to Rolleghemcappelle are also clearly visible – more so if you click to enlarge, because the detail is superb. All of which leaves Philip beholden to all of us to explore and photograph and see what, if anything at all, remains. Heh heh. In the meantime, if you’d like to find out a little about the fighting that took place at Ledighem in 1918, and pay a visit to the town – for town it is now – cemetery, where eighty five men, all but a handful killed in the last six weeks of the war, now lie, then click here. This entry was posted in 1918 - The Advance East, Documents & Artwork. Bookmark the permalink. A series of aerial photos have been made on October 1st and 7th 1918. The historical society of my town has got several of them. Ledeghem saw ‘action’ on the 1st and 14th of October, the second attempt being successful as to our liberation. Our town was – starting from Ypres – the first town that wasn’t competely destroyed during WW1. It was declared ‘half destroyed’. Rollegem-Kapelle was ‘not destroyed’, at only a few miles further from the front. 56 bunkers were to be found in our town, now only a few are left (and one is open for the public). On the 1st of October, about 100 civilians still lived in Ledeghem (over 3.000 in 1914), the others having fled or forced to leave their home. Part of it was held by the British and Belgian troops after the 1st of October. About 200 British soldiers died liberating our town. Thanks Filip. That most certainly adds to this post. Btw, could you let me know where the bunker/s are in Ledegem sometime. No hurry. I have recently bought a book entitled Armageddon’s Walls, detailing all (?) the remaining British bunkers on the Western Front, which of course begs an expedition at some point (Baldrick is unaware, so don’t mention it to him), but I don’t know of a German equivalent. Thanks. I was out in Ledegem this weekend. My great uncle died near the bunker at Kirton Farm (Teofani Railway Crossing) on 14 October 1918. I have lots of documentation about this episode. He and 15 other men were buried by the railway crossing before being reinterred in Dadizeele New British Cemetery in the 1930s. What I am looking for is an aerial photo taken just SOUTH of Ledegem near the railway crossing by Kirton Farm (by the road to Klephoek). Do you have such an aerial photograph in your town society?? My name is Ian Livingston and I was out in Ypres, Poperinge and St Pieters area last week to be at my Great Grandfathers grave in Haringhe on the 5th October 2018 to pay tribute to his sacrifice. I believe he was at the 5th Battalion (joint) HQ near the meningitis roulers railway. At midnight on the 3/4TH October, just as they were being withdrawn from the line, a shell hit the HQ and injured several members of A Company and I believe this is the action where John Campbell was mortally wounded. Using the diaries I have traced his advance to this point but would love to identify if possible the location. I believe A company were on the left of the line and I also believe the HQ was located at this end in a Pill Box near the Belgium Forces. Any help would be greatly Appreciated. Hopefully one day I would like to walk the route the took. Hello Ian. Thanks for taking the trouble to comment. I rather hope that Filip (see first comment) reads it because he’s the man that may be able to help. He does look in quite frequently so hopefully he will. Me, I’m just pleased you found my site.